Climbers make their way up the mountain. "We started out with no down suits this morning. Now we've got them on," said Dave Hahn as the wind muffled his words transmitted via radio from the North Ridge of Everest. "Things aren't too bad wind-wise." Just this morning, Eric Simonson commented that it was "remarkably peaceful" up on the North Col. We are relieved to report that the climbers are safely up at Camp V, at 25,600 feet, after several hours of climbing in the wind from the North Col. Simonson climbed partway to Camp V and then opted to turn around and head back down to Advance Base Camp. "I didn't feel good," he reported as he descended to a lower elevation. No words can describe the atmosphere at Camp V better than Norton's from 1924: "On arrival one crawls into the tent, so completely exhausted that for perhaps three-quarters of an hour one just lies in a sleeping bag and rests. Then duty begins to call, one member of the party with groans and pantings and frequent rests crawls out of his bag, out of the tent and a few yards to a neighbouring patch of snow, where he fills two big aluminium pots with snow, at which time his companion with more panting and groans sits up in bed, lights the metal burner and opens some tins and bags of food... Perhaps the most hateful part of the process is that some of the resultant mess must be eaten, and this itself is only achieved by will power: There is but little desire to eat—sometimes indeed a sense of nausea at the bare idea—though of drink one cannot have enough." 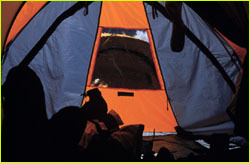 Inside a tent on Everest. Much is the same for today's climbers: Mustering up the energy to leave one's tent to collect snow for melting into water is reportedly still one of the most difficult tasks at altitude. Our team will be eating special meals that don't require water as an ingredient. Lightweight aluminum pots are used to melt snow that a climber can put a pouch of food in. As the water heats, the contents of the pouch (chicken with vegetables or beef stroganoff) heats and the resultant hot water can be used for drinks. It's hard to imagine, but all foods are frozen at Camp V unless heated up. The climbers will go on supplemental oxygen tonight for the first time. This should aid them in their efforts tomorrow. There was a marked change in the air today. This morning dawned hazy and the afternoon brought heavy clouds that enveloped the entire mountain. The air became cooler and a light murky haze hung like a veil over the nearby mountains, a testimony to the forest fires that have been burning in southern Nepal. 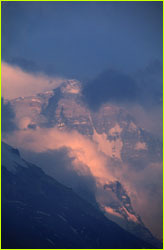 Some climbers resting at Base Camp think it is a result of the full moon, which has been known to effect a change in the weather pattern. Is this the first evidence of the monsoon? "We're in snow flurries," reported Conrad Anker over the radio from Camp V at 3:00 p.m. "Every now and then the cloud lifts and we can see up to the Second Step and the summit." We are hoping for a clear day tomorrow with no snow cover at the 27,000-foot elevation of the search site to make things easier for the team. Snow cover could render their search useless. Hahn allayed our fears on the 6:00 radio call, as the wind had picked up once again: "The snow that fell," he explained, "is rapidly blowing to Texas." 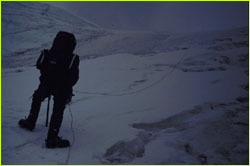 The climbers, who are now at a comparable altitude to the South Col on Everest's south side, will get up at 3:00 a.m. and begin the long process of getting ready for their climb up to the snow terrace for their search. Leaving Camp V at 5:00 they will climb into view for us at Base Camp at about 7:00, when they reach 26,500 feet. Jochen Hemmleb, who will have his 200-power telescope trained on the route up to the snow terrace to monitor the team's progress, has high hopes for tomorrow: "It could be a big day for the expedition, it could be a big day personally, and it could be a big day that changes mountaineering history." Photos: (1) Thom Pollard; (2,3) Liesl Clark.